Account book page showing general store-type purchases. WHS collections 1972.25.1, gift of Mrs. Arthur Golding. In 1972 the Society received a donation of a day book from a Mrs. Arthur Golding, who had previously lived at 1600 Poquonock Avenue. While making repairs on her home, workmen found this day book in a blind attic (a space that had been sealed off from the rest of the attic). There was no indication inside the book as to owner of the business or its location, so for cataloging purposes, staff at the time had titled it “1826-1830 Account Book for General Store in Poquonock.” Such a vague yet intriguing title has led more recent staff to wonder about its origins, and as a new research library volunteer, I was given the task of finding out more. Where to start? I began by examining the entries in the book. It was pretty clear after reviewing the names of the people mentioned in the entries that the business was indeed located in Poquonock, as the family names–such as Griswold, Holcomb, Marshall, and Hatheway–were of those who lived in the Poquonock area of town. In reviewing the transactions from the store’s first year showing sales of sugar, oats, powder, and postage, it became apparent that it was primarily a general store and a post office. Later transactions for items and services like hardware, lodging, meals, liquor, livery, and legal writs indicate that it eventually served as an inn and meeting place. The last year or so revealed numerous transactions for food and drink suggesting that it was more of a tavern, although it continued to serve as the post office throughout the length of the ledger. I knew it was common in the early 19th century for the local postmaster to provide mail service out of his home or business, so I set out to see if I could determine who the postmaster in Poquonock might have been in this time frame. I reviewed A New History of Old Windsor Connecticut by Daniel Howard (1935), and in a section describing Windsor post offices, Howard points out that in 1827 a Windsor man named David Marshall wrote to a former neighbor, “Furthermore we have a new post office granted us in this place of which Cicero Phelps is appointed Postmaster.” Further investigation led me to a website chronicling Connecticut postal service history, which confirmed that Cicero Phelps was the first postmaster for Poquonock and he held the job for many years. Therefore, it seemed logical to conclude that Cicero Phelps was the owner of the business. Having identified who owned the business, the next question was where was the business located? While the Society has no maps from the 1820s to show the location of Cicero Phelps’ business, it turns out that an 1855 map shows the Cicero Phelps Hotel on the northwest corner of Poquonock Avenue and Prospect Hill Road. 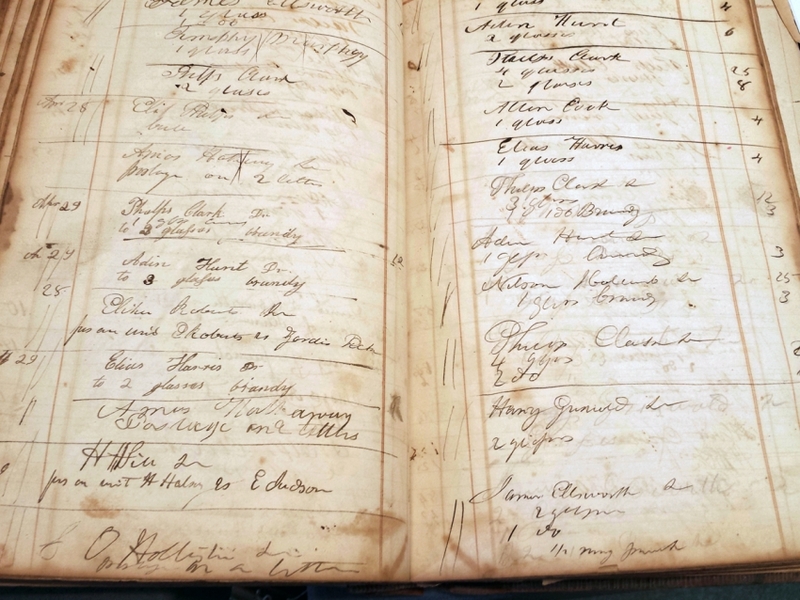 Given the inn-related transactions in the day book, it seems very likely that our Cicero Phelps owned the business and probably the building, at least until a few years before his death in 1858. The only problem was, the hotel was not located where the day book was found (1600 Poquonock Ave.) so if the business was originally located at Cicero Phelps’ hotel, how did it get a half-mile away to Mrs. Golding’s attic? I decided to review the town’s land records and notices in the Hartford Courant to uncover what might have happened to Cicero Phelps’ hotel. An ad in the Hartford Courant on March 7, 1855, reports that Daniel Buck, Jr. was offering for sale property previously occupied by Cicero Phelps as a hotel. 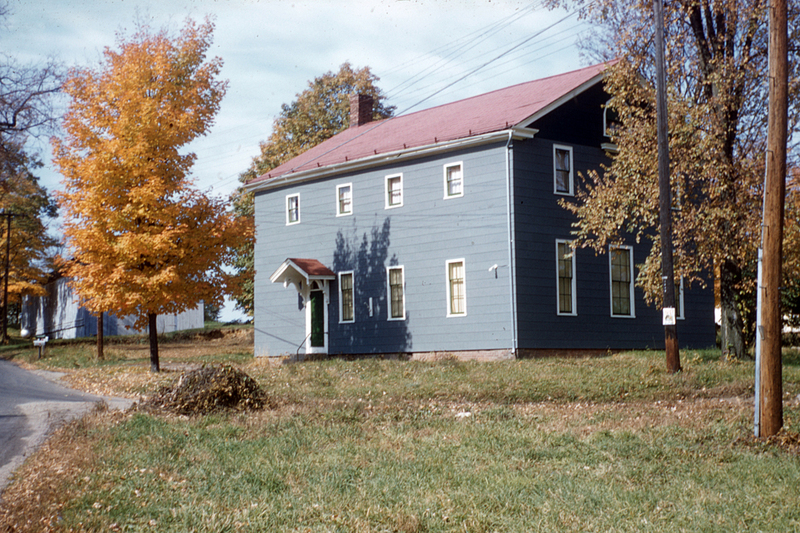 Land records show that in late 1858, various businesses and workers had liens on the property for materials and labor they provided to split the Phelps “Tavern House” in two and make it suitable for a school. Daniel Buck appears to have been the general contractor. Records also show that he sold the property to Henry Keney of Hartford (and of Keney Park fame), who in turn sold it to the Windsor Middle School District in 1859. An 1869 map shows “School No. 8” on the same location as the hotel, the northwest corner of Poquonock Avenue and Prospect Hill Road. The District 8 Elm Grove School as it looked in the 1950s. This building was later used as the Windsor Grange. WHS collections 2017.4.292. 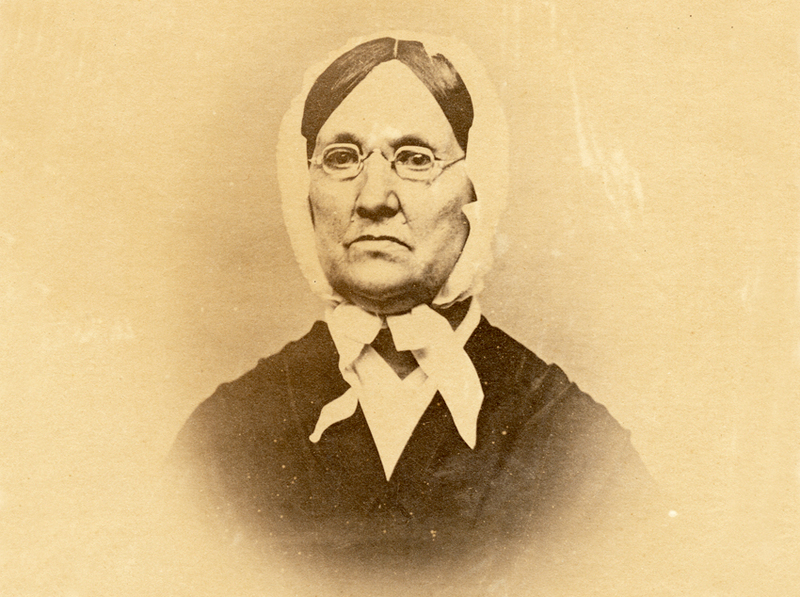 Photo attributed to Daniel Howard. Daniel Howard’s book has an extensive chapter on Windsor’s educational history, so I checked out what he said about School No. 8, later known as the Elm Grove School. Without mentioning a specific address, he notes that “the Eighth District bought a tavern [from Henry Keney], cut the building in two, and changed part of it into a schoolhouse.” When the house was split the front part was moved to a different location, while the rear part, consisting of a two-story ell with a ballroom upstairs, was left on the site. It was not unusual in the 19th century to move houses to other locations, so could this house have been moved to 1600 Poquonock Avenue? I seemed to remember that in the donation letter Mrs. Golding’s house had been moved from a different location. The donation letter indicated that Mrs. Golding had a conversation with a friend, Carrie Marshall Kendrick, about her find. Mrs. Kendrick said that Mrs. Golding’s home at 1600 Poquonock had actually been moved from a different location and was then used as a general store, post office etc. that matches with the contents of the day book. Is it possible that this was the portion of Cicero Phelps hotel that was moved? Mrs. Kendrick, who lived in the area from 1883 to 1963, casts doubt on this as she describes the house that moved coming from a different location from Cicero Phelps’ hotel. So, I went back to the maps to see if they showed what existed at 1600 Poquonock Ave. (although in those days house numbers did not exist). 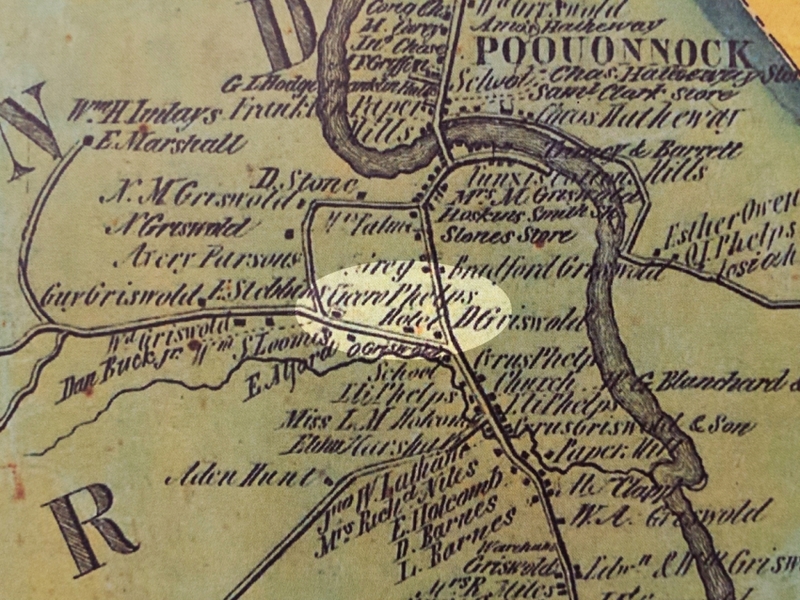 Portion of an 1869 map of Poquonock with Elm Grove School (School No. 8) and Hungerford Saloon highlighted. 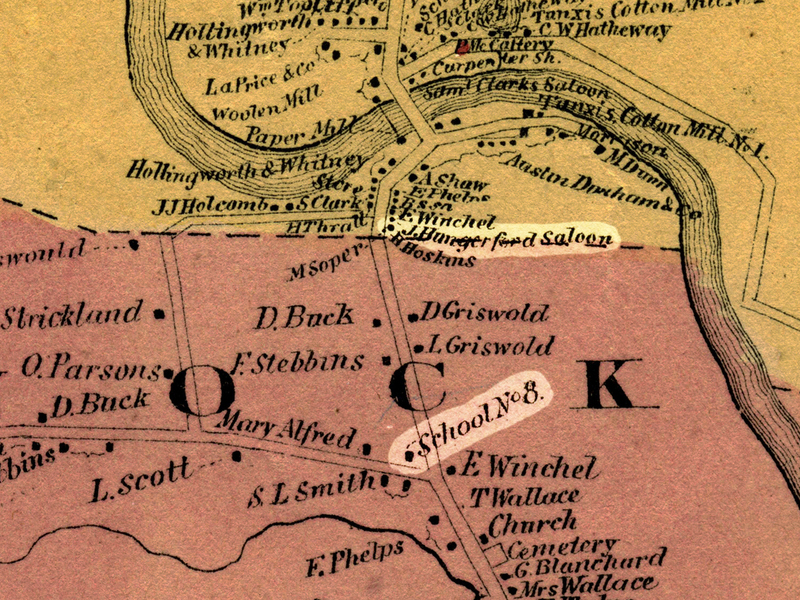 The 1869 map of Poquonock showed a Hungerford Saloon at the approximate location of Mrs. Golding’s house. This name rang a bell. In reviewing the entries in the day book, I found some handwriting samples in the back that were clearly not a part of the original entries made for the business. These writing samples mentioned several names including Melville E. Hungerford and Helen Hungerford. This provides some evidence that the front part of the Cicero Phelps building might have been moved to the spot of the Hungerford Saloon. I wasn’t totally convinced of this so I wondered whether the Hungerfords might have acquired the day book in some other way (other than physically moving the building). Was there some connection between Cicero Phelps and the Hungerfords? 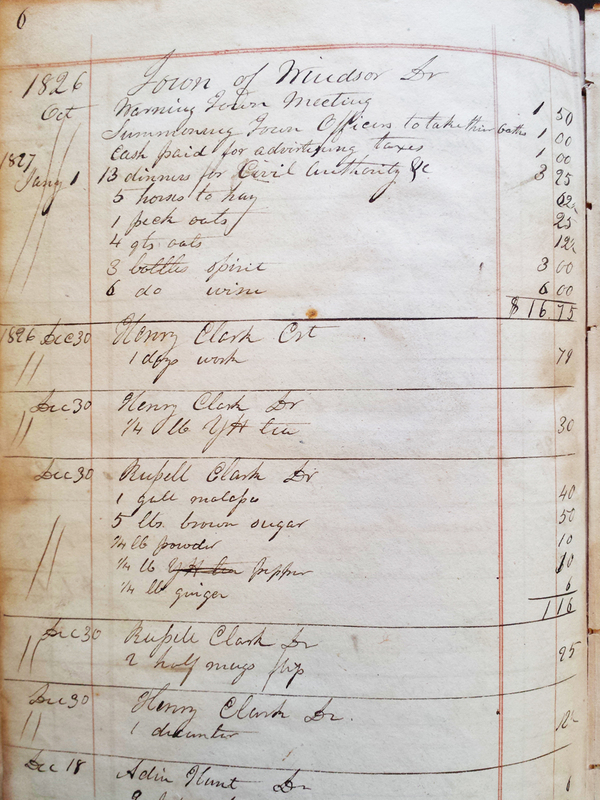 A few entries from the day book, some of which show Phelps Clark’s numerous transactions for buying drinks. WHS collections 1972.25.1. One intriguing theory is based on transactions in the day book. 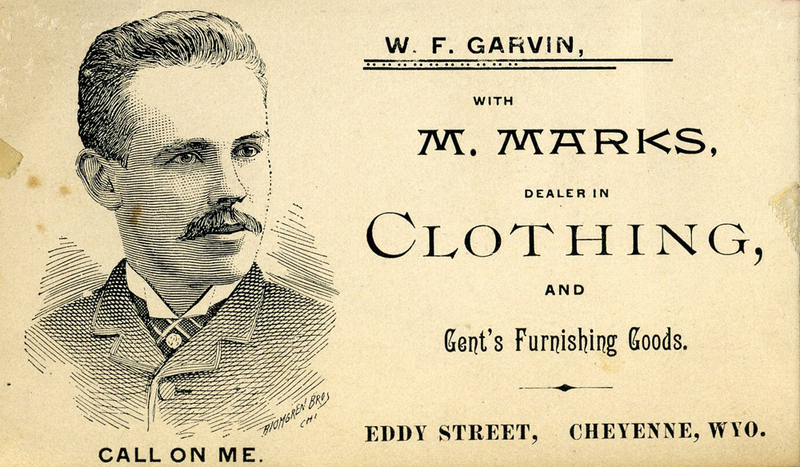 A regular purchaser of tavern drinks like flip was Phelps Clark. It appears that Phelps Clark also worked for Cicero Phelps as he was frequently given credits for jobs done for the business. Perhaps he worked there to pay his bar tab! I did a search on Ancestry.com and discovered that Helen Hungerford’s maiden name was Helen Maria Clark, and she was third cousin to Phelps Clark. So, perhaps Clark was in possession of the day book and later gave it to his third cousin who was involved with running a similar business. So, either the day book moved with the building of Cicero Phelps to the location at 1600 Poquonock or the day book itself was moved to the Hungerford Saloon and was placed in the attic at this location. Mystery solved! By Rob Hoskin, volunteer, 2017.